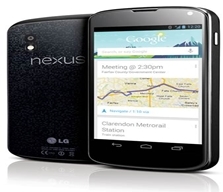 Google’s latest Smartphone Nexus 4 by LG has been released in the United Kingdom and it’s been available in UK Smartphones carrier O2.The O2 has announced that Google Nexus 4 will be made available on different monthly contracts from November 13. Now let’s talk about the features of Google Nexus 4. It comes with a big touch screen of 4.7 inches and the leading one with the Android Jelly Bean 4.2, processing power is up to 1.5 GHz which is Qualcomm Snapdragon S4 pro processor with a 2 GB of RAM, it has two camera front and the rear, the front one is a 1.3 megapixel while the rear one is a 8 megapixel camera and it comes in two different storage capacity which are 8GB and 16 GB. Nexus 4 has a crystal clear screen and our customers will love Android 4.2. It’s the best way to experience Android, whether you’re trying it for the first time or have used it before, and getting a free TV with a Nexus 4 is the absolute icing on the cake.